a book chick: "Today Will be Different"
Oh, such good intentions from our beds. We meet Eleanor as she is waking and follow her well-intentioned day through Seattle with far-flung flash-backs to Aspen and New Orleans and meeting Eleanor's crazy cast of life characters. 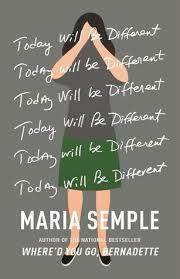 Part of it reads like a voice-over ... and it includes a small graphic novel in the middle (part of the story line) ... which got me thinking ... who is this Maria Semple? She majored in English at Barnard College and worked on TV shows such as Mad About You, Arrested Development, 90210. Funny, snarky, fast-paced, circuitous. Fun female fiction. Julia Roberts will be playing Eleanor in the TV movie version. my source: LOVED Where'd You Go, Bernadette so when I saw this IN HARDCOVER at Costco...I splurged. my verdict: A pleasant diversion. Not terribly memorable and NOT AS GREAT AS Bernadette. I have gifted Where'd you go Bernadette quite a few times over the past few years. For some reason I think it is the perfect gift for a new momma (along with board books for the new babe) but I may be way off base. So, I am eager to read this one. Oh! I can hear you on that ... I was much more amused by it when I sort of re-read it to review. Maybe smaller doses? I love your party analogy.